Due to manufacturer's restrictions we are unable to ship Hilly products to Great Britain. The Hilly Monoskin Cyclo Sock is high performance training sock. "Great socks .. should last me a long time!" "Good quality socks! I will buy again!" 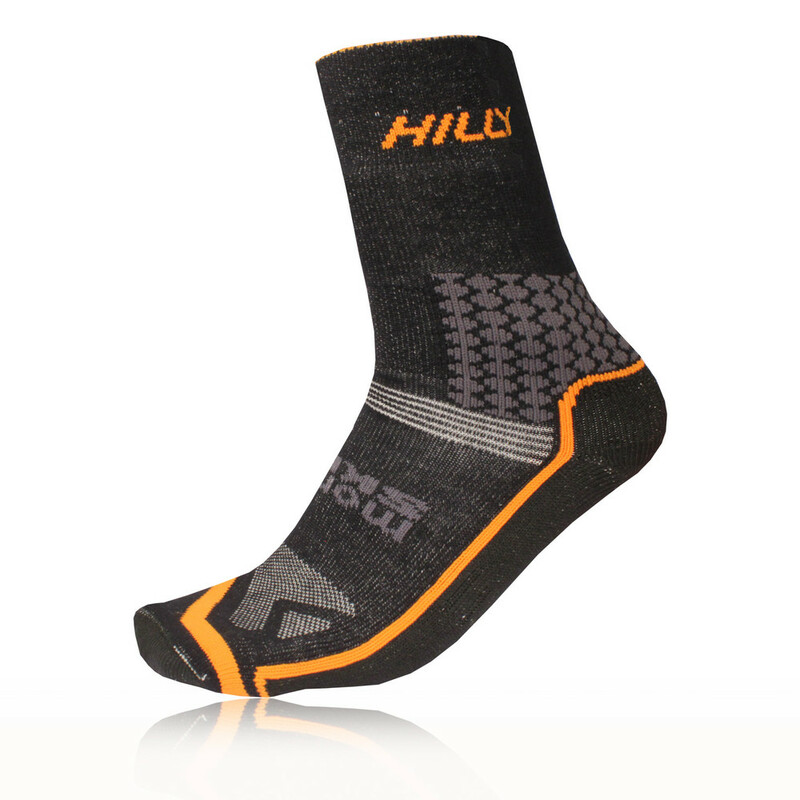 The Hilly Monoskin Cyclo Socks feature anitmicrobial, thermodynamic and wicking containing X-Static the silver fiber, which keeps them free from odour causing bacteria. 2 layers of fabric wick sweat through the soft polypropylene inner layer to the fine cotton outer layer, keeping skin dry. The socks also have ventilation panels on the upper foot of the ankle for enhanced ventilation and increased flexibility. Cushioned toe protection and seamless toe seams help to prevent blisters. Y heel and arch grip section for an all round better fit. The Company was formed in 1992, by Dr. Ron Hill, MBE*, the former European and Commonwealth marathon champion. At the time he saw an opportunity to develop a range of technical performance running socks. With a PhD, in Textile Chemistry, he was able to combine his technical expertise and running background to produce a core range to cater for the needs of the runner. The range was split into two categories namely: Mono Skin and Twin Skin. The Mono Skin (single layer) range included the Marathon Fresh, Off Road and Super Racer Plus (now renamed Lite) and the Twin Skin (double layer), Moisture Management. All four socks have been improved over recent years. Ron, accompanied by his sons, Steven and Graham and Stockport Harrier, Dean Loxam, developed the business and the range was sold to the specialist running stores by a team of external sales agents (many of whom remain with the company today). Major developments have included the launch of a complete range of socks, in particular the Mono Skin Supreme - 'Probably the most technical sock in the world' and the new Twin Skin range - 'Probably the best double-layer socks in the world'. .Freshguard - Superb anti-microbial and anti-odour protection, helping keep your feet fresh all day. Seamless Undertoe Construction - Enhances durability and comfort. Arch Grip Heel - Improves the fit of the sock, helping reduce irritation and slippage.